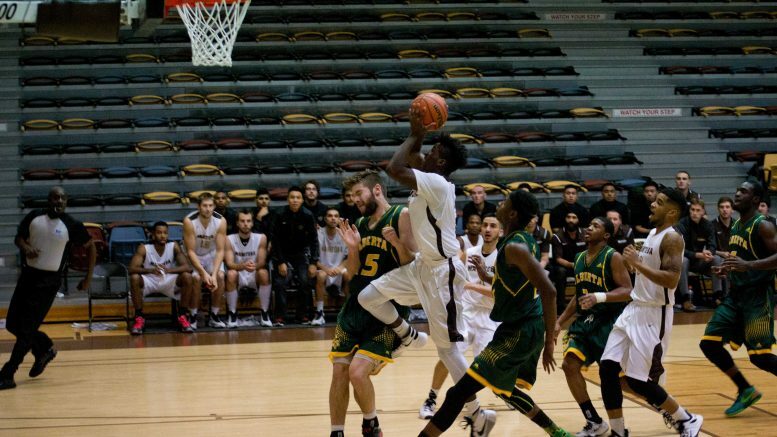 This weekend, the University of Manitoba men’s basketball team played a two-game series against the UBC Thunderbirds in Vancouver. The Bisons lost 96-89 on Friday, and fell just short on Saturday by a score of 75-72. The Bisons now hold a 2-4 record and sit in the middle of the Canada West standings. Despite a fourth quarter comeback to get within four points, the Bisons did not have enough left in the tank to earn the victory on Friday. Manitoba was led by Ilarion Bonhomme with 31 points, 20 of which came in the second half comeback; Bonhomme also had seven boards, second to Keith Omoerah who had a team-high of eight. UBC’s win was powered by Conor Morgan’s double-double, as he netted a game-high 35 points and 11 rebounds. The Thunderbirds won the turnover battle in the first half, as they were able to force 14 by Manitoba and only committed five themselves. UBC took advantage of the turnovers given to them, as they shot just over 50 per cent in the half. Morgan scored 22 of his 35 points within the first two frames, helping the home side to a 46-30 halftime lead. The herd came out much better in the third, and were able to keep the lead from growing any bigger, still down by 16 entering the final frame. The Bisons made a comeback attempt in the fourth quarter to cut UBC’s lead to four, but the Thunderbirds pulled away in the final few minutes to ice the game. The Bisons second half surge was led by Bonhomme and Omoerah. Omoerah put up 16 of his 18 points during the second half. Justus Alleyn put up four straight points to cut the lead down to just four points. Morgan then added seven of his points in the final three minutes, and allowed UBC to take the win. The Bisons lost the second game of the weekend against the UBC Thunderbirds 75-72. The herd had a lead at halftime but were not able to hold on. They made a comeback in the final quarter, before losing the nail-biting game that had six lead changes throughout. With the loss on Saturday, Manitoba was swept for the first time this season. Captain AJ Basi led in scoring for the visitors, putting up 17 points in the game, and Morgan once again led the home side, scoring a game-high 22 points. The first quarter started slow, with the Bisons only shooting 30 percent, and UBC shooting 32.3 percent, leading to the 12-12 tie heading into the second quarter. Shots began to fall a bit more in the second quarter, more so for the Bisons who got on a 9-0 run late in the half. With the late surge, the visiting Bisons were able to take a 34-27 lead into the locker room at halftime. Basi led the Bisons with 10 points in the first half, but it was Omoerah who led the late charge for Manitoba. Omoerah hit four key free throws late in the half, starting off the 9-0 run. The Thunderbirds outplayed the herd in the third quarter, ending the frame on a 11-1 run; UBC held a 54-50 lead heading into the final quarter. The herd were able to grab their first lead of the fourth quarter with just over a minute left. The comeback stemmed from Alleyn, who led the Bisons with 10 points in the final frame. But a late jump shot from Jordan Jensen-Whyte gave UBC a one-point lead with just 40 seconds left to play. The Bisons were unable to get a shot to fall on their next possession, and UBC iced the game at the free-throw line. Manitoba will be back in action on Nov. 25-26, as they host the Alberta Golden Bears at the Investors Group Athletic Centre.